﻿Filmmaking and Television Production Program﻿ is designed as a revolutionary hands-on quick guide to the roots of film and television production, with a mission to help students easily find the area in which they will improve their creativity and artistic skills the best. Most importantly find what area is best suited for them, save time and money, give the student the opportunity to have them work as interns for production companies who may need our students for projects that the production company is working on. Fast track career - intensive training scheduling 25 hours each week, 5 days or more a week, for a total of 500 hours in 4 months! Hands-on experience - At the end of the Filmmaking and Television Production Program, each film student will come out with a DVD Film Reel containing 14 edited assignments, including music video, TV commercial, documentary film and short narrative film. Build an amazing portfolio for any student to graduate with. 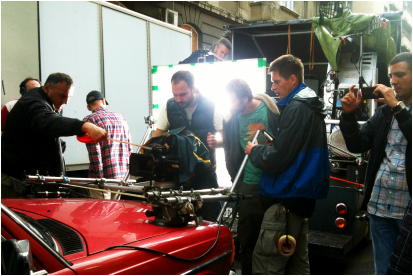 Internship - Film school students will have opportunities to work as interns and or apprentices for various production companies who are already waiting for our film students to graduate. Top of the line equipment - Film students using school's most current digital cameras, lighting and sound recording equipment. Four cameras in the system and a four channel full HD mobile video studio places the program ahead of other similar schools in North America.